So I got my first taste, and it was sweet. I was very happy with myself about the recent Comcast savings and I just had to have more. I know it was only 20$ a month but that just goes to show you that I never, and I mean never, go out of my comfort zone for money to save money…I just think, well thats what it costs so I will pay it.. When we got back from California, I was still on a high from the Comcast reduction (ask my wife, still 3 weeks later I would say to her, “I am so happy about Comcast!” she got pretty annoyed 😉 I decided to sit down and look at all my finances. 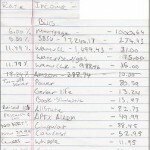 I took a regular old notepad and started writing out all of my income and all of our expenses. The expenses came pretty close, it was like a zero based budget..without the intention of saving or making good use of the money. 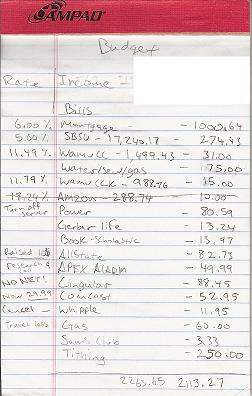 Here is the notepad, (edited for security reasons) you can see I wrote the interest rates or anything important about the expense in the margin. It may look like a bit of a mess and some of this will not make sense to everyone and that is because it is my finance and I am familiar with each of these things. You can see that even while sitting down and writing all this out I had thought of some ideas to lower my monthly outward flow of cash. I started using some of the tips from The Consumerist again and called up all the credit cards to try and negotiate a lower interest rate…too bad they are all through the same company and would not budge even after telling them I would cancel. Funny thing is, though all of the CC cards were through the same company, each rep told me “this is the lowest rate our company can offer right now” even thought one card is a wopping 18% and the others hover around 11%. I quickly payed off the 18% card at that moment. (more about what I did for the others in a later post) Also note that I have “no net” written in the margin for my Cingular/ATT phone bill, because my daughter likes to press that NET button on both of our family phones and costs us a bit of cash each month, more on my phone solution later as well. I had no idea that these credit cards were at these percentages and I also did not realize how much my family was spending in each category each month. This was a huge learning experience for me and helped me get the ball rolling towards a better financial future. I would recommend to anyone to drop the ignorance is bliss act and get on top of their finances. There are so many things out there that can help but one has to know where to start.